Biolink's research expeditions reflect our engagement with broader scientific investigations and our committment to long-term ecological monitoring programs. More importantly perhaps, we believe that in order to protect and nurture the environment, you need to understand how it works. Let us share some of our knowledge and enthusiasm with you through your active participation in our current research programs. Lake Broadwater Natural History Association, Southern Cross University and Hero Ecology. 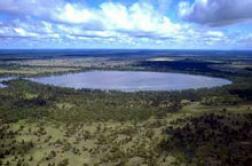 Lake Broadwater is a ephemeral wetland located to the west of Dalby in southeastern Queensland. The lake has long been the focus of research interest by scientists and interested members of the local community. The Lake Broadwater Conservation Park covers an area of 1,800ha and is jointly managed by the Queensland EPA and Wambo Shire Council. Lake Broadwater is located on the western edge of the Darling Downs. Vegetation includes lakeside Red Gum woodland with Pilliga Grey Box - Ironbark - Cypress Pine - Brigalow forests and woodlands in more arid areas. Following rain, the lake becomes a mecca for waterfowl. Over 240 bird species have been recorded. Our annual expeditions to Lake Broadwater primarily focus on koalas to which end we have established a series of permanent monitoring sites based on a 350m x 350m sampling grid over the entire area. Field work involves sampling for koala activity using a methodology called the Spot Assessment Technique. Using GIS modelling our objective is to obtain an accurate picture of changes to the distribution of koalas within the Lake Broadwater Conservation Park over time. Lake Broadwater supports an amazing biodiversity. During the course of our field trips, other ancillary survey work such as censusing the PPBio grids and assisting post-graduate research projects will invariably be taking place; one thing we guarantee, there won't be much time to sit around and twiddle your thumbs. We camp in the Lake Broadwater camping area with access to work space, hot showers and cooking facilities. Participants should bring their own camping equipment, including a sleeping bag, mat and pillow. Minimum Group Size: Max 8 - 10 adults. Meals: Food and beverages are supplied. Next field trip: 8th - 14th October, 2017. Getting there: Return travel to Lake Broadwater will be by 4WD vehicle from the east coast (Brisbane or Coolangatta); pick ups can be arranged en route.